Today we spent some time in the scenic mountain town of Estes Park. 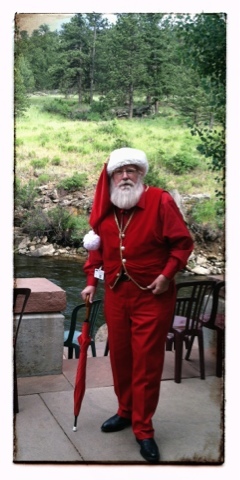 We happened upon a jolly fellow walking along the banks of the Big Thompson River, which is a fine trout stream. As it is the month of July, I inquired as to his current mission. "Vacation, my dear chap", he said, "What are you doing?". It seemed like a fine answer to me, and I imagine everyone needs a break. I know that the Flyfishing companies are soon to release new gear at the big show in order to keep him busy during the Christmas season, and walking along the banks of a trout stream is a fine way to relax. After all, there are only 174 days until Christmas! In the meantime...enjoy the Fourth of July, and the tremendous country that we are blessed to live in! Was that you in that suit?